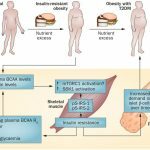 1 What is Insulin-Like Growth Factor 1? Growth Hormone, made by the pituitary gland, stimulates the liver to produce IGF-1 and IGF-1 subsequently stimulates growth in cells throughout the body, leading to growth and development (as in the womb and through adolescence), strengthening of tissues (improving bone density, building muscle), and healing (skin, bones, gut lining, etc. ), depending on what the body needs (R). In several organisms such as fruit flies, worms, and rats, IGF-I is involved in the control of lifespan (R). In most studies in mice, inhibiting Growth Hormone/IGF-I results in an increase in lifespan (up to 55%) (R). However, in humans, the association between IGF-I levels and life expectancy doesn’t hold up (R). Several population-based studies describing a relationship between IGF-I and risk of dying were published with conflicting results. Two studies showed higher risk with higher IGF-I levels, while three showed higher risk with lower IGF-I levels. And in six studies there was no clear association at all (R). Overall, however, having either low or high IGF-1 increases risk of dying from all causes (R). In a meta-analysis of twelve studies done in 2011 with 14,906 participants, the risk of dying from all causes was increased in subjects with low as well as high IGF-1 levels (R). People with low IGF-1 were at a 1.27X increased risk of dying from all causes, while those with higher levels were at a 1.18X increased risk (R). I would say that when you look at all of the evidence, low IGF-1 levels are more likely to be a concern than high IGF-1 levels, but you still want to strike a balance (R). The activity of IGF-I is influenced by at least six binding proteins (IGFBP). The most abundant is IGFBP-3, which binds more than 90% of IGF-1 in the circulation. Although IGF-I and IGFBP-3 are typically well correlated, there is speculative evidence that IGF-1 has an independent impact on disease risk, for example, on cancer (R). The length of telomeres in the DNA have shown to be important predictors of longevity. IGF-1 has been shown to correlate with greater telomere length in healthy subjects of all ages (R) and in elderly men, in another study (R). In the famous Framingham Heart Study of 525 people between the ages of 72 and 92, greater levels of IGF-1 were associated with decreased risk of dying in the next 2 years (R). IGF-1 helps prevent age-related cognitive decline by promoting new cell growth in the brain (in rats) (R). Aging (R), and its associated frailties, such as lowered muscle strength, slower walking, and less mobility are associated with lower levels of IGF-1 in older women (R). Critically ill patients tended to have lowered IGF-1 levels (R). IGF-1 increases glutathione peroxidase, an important antioxidant enzyme (R). It protects cells exposed to radiation, by preventing cell death and increasing the antioxidant status (R). Join the SelfHacked VIP members area and make your voice heard. When IGF-1 levels are low, inflammation tends to be high (R, R2). In mouse models of autoimmunity and brain inflammation, administration of IGF-1 delayed disease onset; however, giving IGF-1 after the disease had developed led to enhanced worsening of the disease (R). Allergic contact dermatitis, Multiple Sclerosis and type 1 diabetes is reduced in mice when they’re given IGF-1 (R). Low IGF-1 levels have been documented in patients with HIV [R] and inflammatory bowel diseases (R). Patients with chronic inflammatory diseases, such as Rheumatoid Arthritis and Lupus tend to have lower levels of circulating IGF-1 (R). IGF-1 helps combat autoimmunity by increasing T Regulatory Cells (R). IGF-1 also decreases MHCI gene expression (R). In animals studies, high histamine levels in the body are associated with low IGF-1 in the blood (reduced via a histamine H1 receptor-mediated pathway) (R). IGF-1 improves learning and memory in animal models (R, R2). It works as an anti-anxiety and anti-depressant in mouse studies (R). Lower levels of IGF-1 are associated with depression in aged mice (R). It speeds up mental processing in a study of 25 older men (R). IGF-1 prevents the accumulation of amyloid plaque in the brain, in a rat model of Alzheimer’s disease (R). It increases BDNF in the brain, mimicking the effects of exercise (R). It helps motor neuron diseases like ALS (Amyotrophic Lateral Sclerosis) (R, R2). ALS is associated with lower IGF-1 (R). 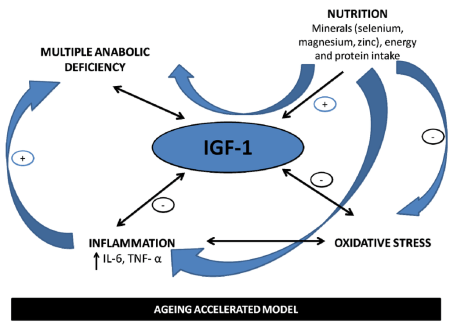 IGF-1 is important for building muscle (R), and for reducing muscle loss in aging and disease (R). Lower IGF-1 is associated with Metabolic syndrome (R). IGF-1 infusions helped lower blood sugar, improve insulin sensitivity, and lower triglycerides in a study of Diabetes Type 2 patients (R). People who are obese are more likely to have lower free IGF-1 (R). In hepatitis C, people have lower IGF-1 and they are more likely to be insulin resistant, and it’s thought that these might be connected (R). IGF-1 has shown to have anti-inflammatory and anti-oxidant effects on blood vessels, stabilizing existing plaque and reducing additional plaque accumulation (R). Cardiovascular disease (coronary artery disease, fatal ischemic heart disease, ischemic stroke, congestive heart failure, as well as slower recovery after a heart attack) is associated with reduced IGF-1 (R). Lower IGF-1 levels were associated with higher risk of stroke in a study of a Chinese population (R). IGF-1 helps restore height in children with IGF-deficiency (R). Poor growth of an infant in the womb can be due to lowered IGF-1 (R). Laron Syndrome (a type of dwarfism) is associated with lower IGF-1 in children (R). Higher IGF-1 levels are associated with greater bone mineral density in older women (R). We know that IGF-1 is a direct promoter of bone growth (R). However, IGF-1’s muscle-building (anabolic) effect may also promote bone density, since increasing muscle mass, in turn, requires greater bone strength (R). In animal models of colitis, burns and jaundice, treatment with IGF-1 improved gut health. It stimulated mucosal DNA and protein content and drastically reduced the incidence of bacterial translocation (R, R2, R3). In animal models of small bowel transplantation, IGF-I improved the mucosal structure and absorptive function and reduced bacterial translocation (R). Infants with gut permeability showed faster healing times when given IGF-1 (R). In animal models, IGF-1 helps clear bacterial infections and improves survival in sepsis (R). In animal models of cystic fibrosis, IGF-1 was able to help clear bacteria from the lungs (R). IGF-1 can help increase natural killer cell activity (R). IGF-I drives B-cells to multiply (R). IGF-1 has been shown to help restore fluid balance in the elderly rats (R, R2) and in humans (R). 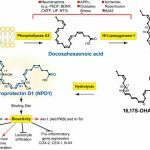 Reviving stagnant collagen synthesis can help protect skin against aging (R). Insulin-like growth factor-I (IGF-I) is the most potent stimulator of collagen biosynthesis and may help prevent skin aging (R). IGF-1 and growth hormone inhibit urea synthesis (R), which may cause lower blood urea nitrogen. Growth Hormone-deficient children given human growth hormone results in lower urea nitrogen and this is due to decreased urea synthesis (R). Advanced liver cirrhosis correlates with low IGF-1, in adults (R). It increases cellular proliferation, angiogenesis, and metastasis and reduces cell death (apoptosis). It also can lead to resistance to chemotherapeutic agents (R). IGF-1 creates an environment conducive to breast cancer and resists anti-cancer drugs (R, R2). IGF-1 was shown to increase invasiveness of breast cancer (R). A review of 17 studies found that IGF-1 is positively associated with breast cancer risk, taking levels of IGF binding protein (IGFBP3) into account, due to its effects on estrogen-sensitive tumors (R). High IGF-1 is associated with an increased risk for prostate cancer (R). Higher IGF-1 levels in the blood are associated with colorectal cancer (R). However, another study found that both low and high IGF-1 increased the chance of dying from cancer (R). NOTE: Studies are unclear. Some take into account IGF-binding protein 3, and some do not. IGF-binding protein 3 (IGFBP3) is supposed to keep IGF-1 levels in the body in balance. When IGF binding protein (IGFBP) levels are low, free IGF-1 is unchecked and can cause growth that is out of control. That’s where cancer may come in. In most cases, elevated IGF-1 is associated with a reduced cancer risk more than an elevated risk (R). Increased IGF-1 may influence acne in adult men and women. While IGF-1 appears to have a stronger effect on acne in women, testosterone/androgens may play a greater role in acne for men (R).